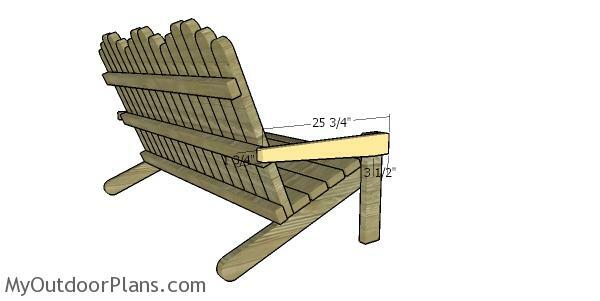 This step by step diy woodworking project is about 2×4 adirondack chair plans. 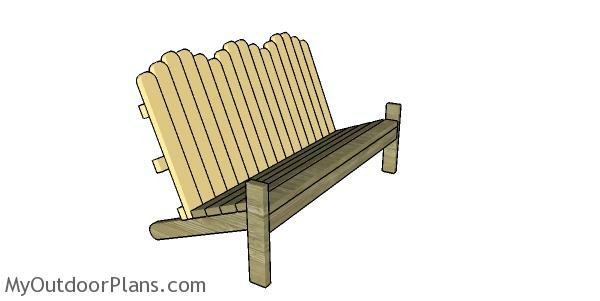 I continue the 2×4 series of projects, with this super straight-forward adirondack bench. 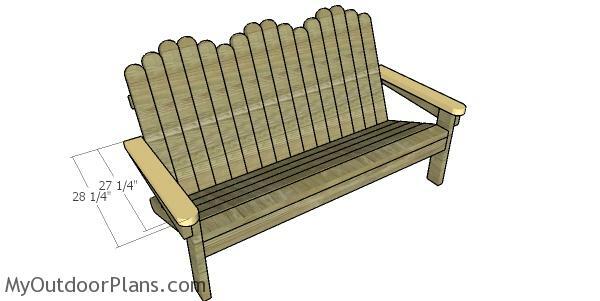 This bench is sturdy, easy to build and it features a beautiful design. Make sure you take a look over the rest of plans to see alternatives and more projects for your garden. Make sure you follow me on Facebook to be the first that gets my latest plans and for some other exclusive content. Also, follow me on Pinterest to get many ideas for your backyard from all the internet! Check out my YouTube channel! See how you can Support Me with no extra costs to you. The first step of the project is to build the back legs for the adirondack bench. 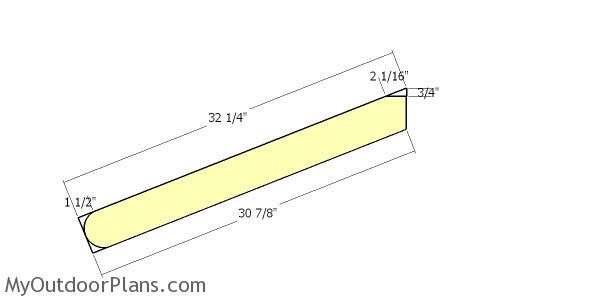 Mark the cut lines on the 2×4 slats and get the job done with a saw. Smooth the edges with attention for a professional result. 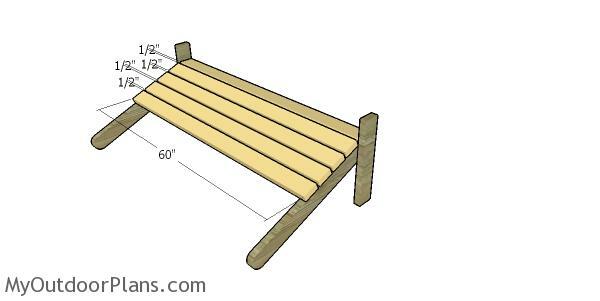 Continue the outdoor project by attaching the 2×4 slat to the front of the back legs. Drill pocket holes through the front component and insert 2 1/2″ screws into the front slat. Make sure the corners are square and align the edges. Add glue to the joints for a durable bond. 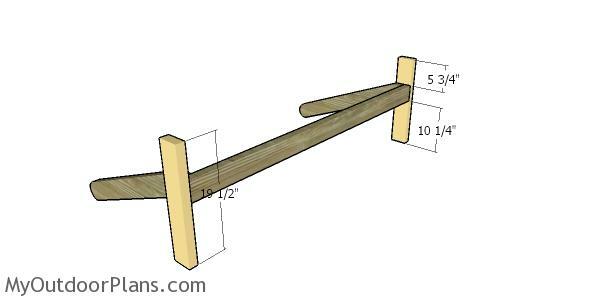 Build the front legs from 2×4 lumber. Clamp the front legs to the back legs and align the edges flush. Drill pilot holes through the frame and inset 2 1/2″ screws into the front legs. 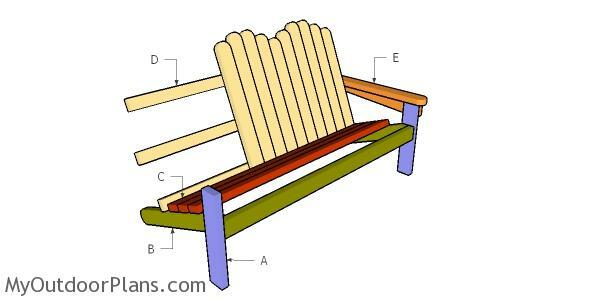 Use 2×4 slats to build the seat for the bench. Place the slats equally spaced, by placing 1/2″ plywood between them. 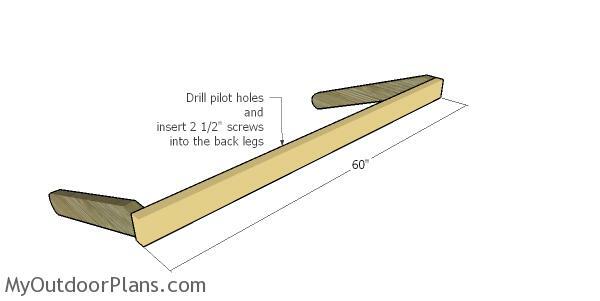 Drill pilot holes at both ends of the slats and insert 2 1/2″ screws into the frame. 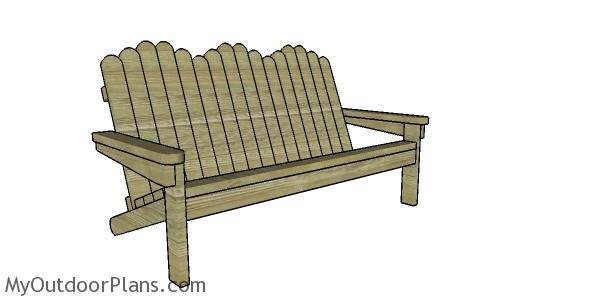 Build the backrest of the adirondack bench from 2×4 lumber. 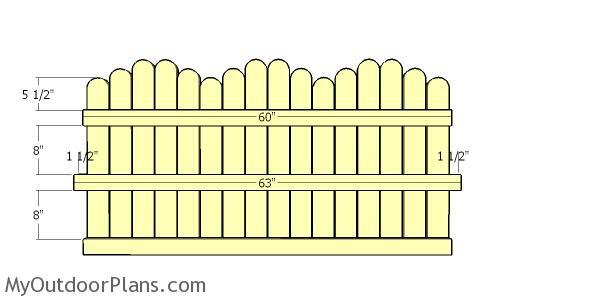 Use a jigsaw to round the top of the slats, as shown in the diagram. Place the slats on a level surface and make sure their bottom edge is perfectly flush one with another . Use 2×4 lumber for the back supports. Drill pilot holes through the supports and then insert 2 1/2″ screws. Attach the backrest to the frame of the bench. Drill pilot holes through the bottom support of the backrest into the back legs. Make sure the backrest makes a 90 degree angle with the seat. Build the armrest supports from 2×4 lumber. Attach the support to the front legs and to the backrest of the chair. Drill pilot holes and insert 2 1/2″ screws to lock the support into place. Leave no gaps between the components and make sure the edges are perfectly aligned. Use 2×4 lumber for the armrests, as well. 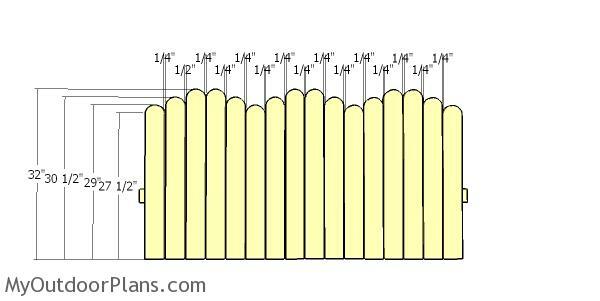 Fit the armrests to the bench frame, as shown in the diagram. Align everything with attention, and use 2 1/2″ screws” screws to lock the components into place. Add glue to enhance the rigidity of the bond. Fill the holes with wood putty and let them dry out for a few hours. Smooth the surface with 100-200 grit sandpaper and remove the residues with a damp cloth. Apply a few coats of stain or paint to enhance the look of the chair. Top Tip: Check out the rest of my adirondack projects HERE. Thank you for taking a look over my designs. Check out the matching 2×4 adirondack chair HERE. 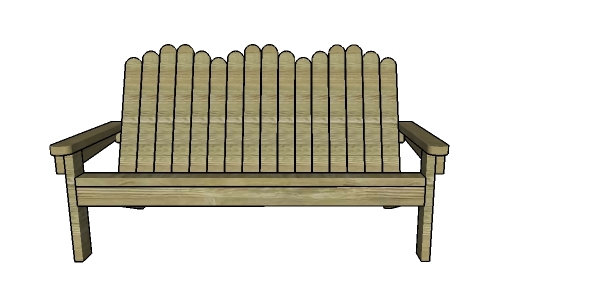 This woodworking project was about 2×4 adirondack bench plans. If you want to see more outdoor plans, check out the rest of our step by step projects and follow the instructions to obtain a professional result.